The ‘big’ opera mounted at Grange Park this year is a bold choice: if Eugene Onegin is a guaranteed box office hit, and is highly adaptable to the intimate spaces of summer opera venues like Iford and Stanley Hall Opera, The Queen of Spades is another proposition altogether: get it wrong and you have a pretty gloomy three hours in the theatre. Full marks therefore to Grange Park not only for giving an outing to Tchaikovsky’s 1890 masterpiece but for giving us such a confident and assured production, as fluent in its dramatic expression as in its often thrilling musical line. 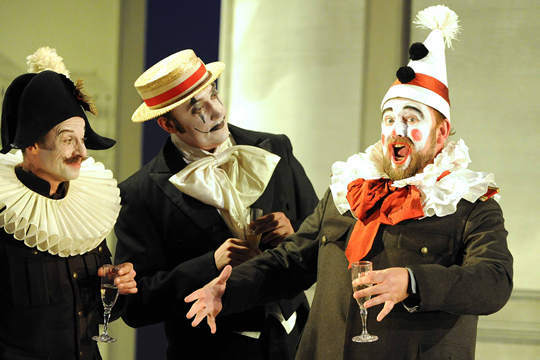 For The Queen of Spades has some very big moments, and Grange Park’s director/designer Antony McDonald did not duck any of them (apart from omitting altogether the delightful but dramatically superfluous ‘Faithful Shepherdess’ intermezzo in the ball scene). What we got was a cogent narrative, some terrific singing and above all, a new star ensemble in the Grange Park pit: for its debut in the venue, the Bournemouth Symphony Orchestra played this Tchaikovsky score with an authentic, gritty Russian string sound, haunting woodwind, sonorous brass and with tremendous overall fluency. Presiding over them, with a sure-paced account of the music that lacked only – and occasionally – the sheer visceral excitement that the orchestration can be made to produce, was Stephen Barlow, who kept a close eye on things, never overwhelmed his singers and excelled in particular in the big choruses, stage and pit working meticulously together (I was at the second performance, on 16 June). Any Queen of Spades worth seeing has to solve the Herman problem – and I have seen some indifferent ones in my time. In his Grange Park debut, Carl Tanner sounded simply magnificent. He has a ringing Heldentenor quality at the top of his voice, and a much richer, almost baritonal sound at the lower end of his range and in the middle. The Grange Park stage is singer-friendly, of course, but I got the impression that Tanner could cope with arena opera with ease. He has a big sound, clean and clear, and his Russian sounded pretty idiomatic to me too! My only quibble with his portrayal of Herman is that he was too stolid and passive – for a man possessed, a man prepared to renounce Lisa’s love in favour of a winning sequence of cards, he has to move us dramatically and make us empathise with him on his strange journey. Tanner failed to deliver on this front – he sang the role superbly, but proved less interesting as an actor. Opposite him, Anne Sophie Duprels (a Grange Park favourite) proved much more interesting, both musically and dramatically. Her voice has become darker and heavier in recent years, as she has embraced some bigger and more dramatic roles, and she is no longer the ingénue that some Lisas try to portray. Duprels conveyed all of Lisa’s growing anxiety about the man that she loves, and her big dramatic moments were seized to the full: what is more, she can act with her voice, and portray her emotions in the musical sound that she produces. 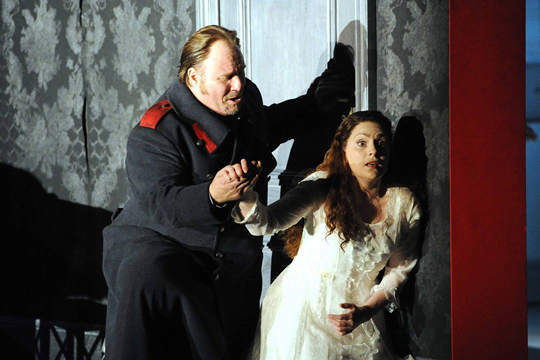 Always watchable, Duprels gave us an intense, dramatic and convincing portrayal of Tchaikovsky’s wronged heroine. The supporting cast were strong. Quirijn de Lang produced a lovely baritonal sound and line as Yeletsky and moved handsomely onstage: not for the first time in opera, one wondered why on earth Lisa should have preferred someone else to him! Sara Fulgoni as Polina seized her moment in her one atmospheric aria and produced gorgeous, effortless low mezzo sound – this was a lollipop in the score if ever there was one. Roman Ialcic impressed me as Tomsky: he has a lively sense of vocal attack, and projects his phrases well, although not always smoothly and evenly. As Tchekalinsky Jeffrey Lloyd-Roberts (whom one could almost now call a Grange Park veteran, as opposed to regular) was firm, dependable and sure-footed. Anne-Marie Owens as the Countess was a dignified, occasionally terrifying presence (and visual reminders of her after her death were used to good dramatic effect). And, happily to report, there were actually no weak links in the supporting cast: the overall standard of solo and ensemble singing was high. The production used a central revolve to move us from scene to scene, and the concept was a clever one, allowing the outdoor and indoor scenes (atmospherically lit by Paul Keogan) to take on their own scenic and atmospheric qualities. The costumes brought us into an unspecified post-Tchaikovsky period, presumably at the end of Imperial Russia, just before the Revolution. Nannies wheeled their baby charges in elegant prams front of stage, parasols were opened and closed as the weather changed, the chorus gave a magnificent account of their hymn to the sun and the summer weather that it heralds, and Tchaikovsky’s constant preoccupation in the work with light and shade was underlined by cast, stage pictures and orchestra all working together. There are real challenges to bringing off The Queen of Spades successfully, and this Grange Park production nailed almost all of them. It is a fine achievement.